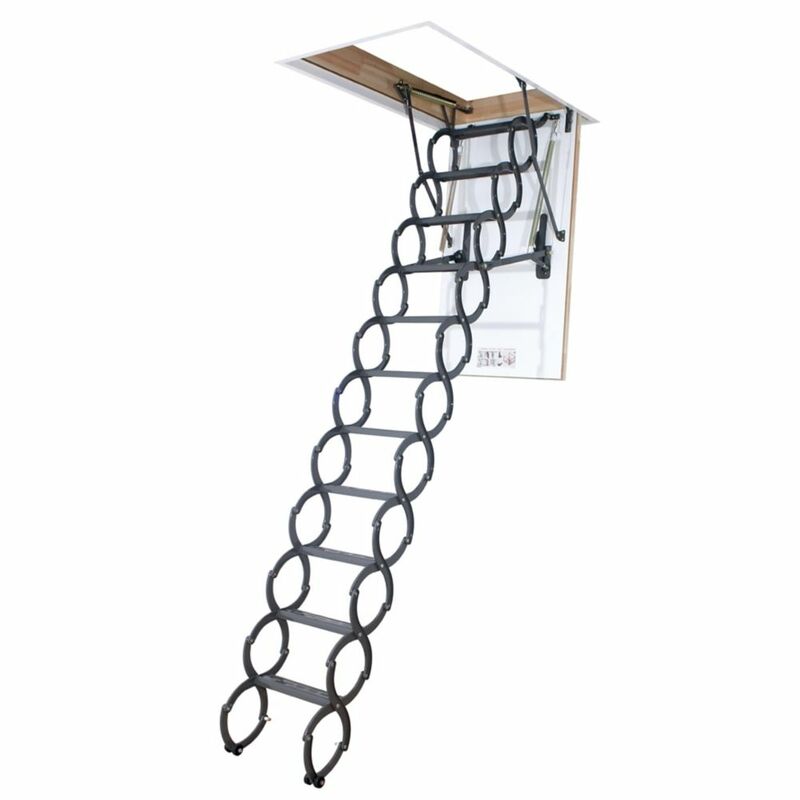 The high-quality LST is a powder-painted, scissor attic ladder assembled from metal links. The LST is a scissor ladder with an insulated and sealed, white exterior door. An extendible opening rod is included. Its construction takes up less space and requires less room to unfold, making it perfect for small spaces. There is the option of adding up to 2 additional steps to bring the ladder height to 10 ft. 10 in. Springs are run parallel with the door to make entry to the attic wider and more comfortable. Door is well balanced - it opens and closes easily (NO sudden movements). Fits rough opening 27 in. x 31 in. and ceiling heights 7 ft. 6 1/2 in. to 9 ft. 2 1/4 in. An elegant attic ladder with high-quality design and materials, the Fakro Insulated Steel Attic Ladder features powder-painted metal and 3-part construction with a locking mechanism for ease of use. Anti-slip steps and rails with rubber ends offer safety, making this 350 lb. duty-rated, ANSI-approved ladder a smart choice. Built to accommodate a variety of home designs, the ladder is adjustable in length, door distance and spring tension to suit the needs of your space. The ANSI approved LWN attic ladder is made from quality pinewood assembled in three sections. The LWN is equipped with a string to pull down the ladder. Length of ladder may be adjusted within 1 inch after cutting the side rails to set ladder evenly on floor. Construction of ladder provides more steps (tread rise about 10 inches) to improve safety and comfort. A red, metal handrail is available for purchase and may be added on either or both sides of the ladder to increase safety and comfort. Ample space between ladder and attic door for comfort and safety. Springs are located parallel to the door making entry to attic wider and more comfortable (the widest entrance on market - compare to other products). Door is well balanced - it opens and closes easily (NO sudden movements). Fits in rough opening 25 in. x 54 in. and ceiling heights 7 ft. 11 in. to 10 ft. 1 in. High quality with attention to details, the ANSI approved LWF fire-rated attic ladder is made from quality pinewood assembled in three sections. LWF fire-rated attic ladder provides easy access to the attic while functioning as a blaze block in case of fire. The hatch is manufactured with the use of fireproof materials and is equipped with a gasket that expands under extreme heat. The LWF attic ladder is fire resistant at EI230 minutes as per EN 13501-2. LWF is equipped with locking mechanism that is installed inside insulated and sealed door panel. Length of ladder may be adjusted within 1 after cutting the side rails to set ladder evenly on floor. Construction of ladder provides more steps (tread rise about 10 in.) to improve safety and comfort. A red, metal handrail is included and may be installed on either side of the ladder. Door opens and closes easily (NO sudden movements). Fits rough opening 25 in. x 54 in. and ceiling heights 7 ft. 11 in. to 10 ft. 1 in. Attic Ladder (Scissor insulated) LST 27x31 300 lbs 9 ft 6 in The high-quality LST is a powder-painted, scissor attic ladder assembled from metal links. The LST is a scissor ladder with an insulated and sealed, white exterior door. An extendible opening rod is included. Its construction takes up less space and requires less room to unfold, making it perfect for small spaces. There is the option of adding up to 2 additional steps to bring the ladder height to 10 ft. 10 in. Springs are run parallel with the door to make entry to the attic wider and more comfortable. Door is well balanced - it opens and closes easily (NO sudden movements). Fits rough opening 27 in. x 31 in. and ceiling heights 7 ft. 6 1/2 in. to 9 ft. 2 1/4 in. Attic Ladder (Scissor insulated) LST 27x31 300 lbs 9 ft 6 in is rated 4.0 out of 5 by 14. Rated 4 out of 5 by Gary from The product is well made and balanced nicely so it is easy to operate. But, the installation ins... The product is well made and balanced nicely so it is easy to operate. But, the installation instructions require more than one person. One, or more to hold the unit from below and one above to do the supports. I added cleats to the sides of the unit and the opening so that I could drop it in from above and do the install single handed. At over 90 lbs just getting it into the attic was a bit of a job. The mechanism takes up a lot of the opening after installation. That is a bit of a bummer. You can't get anything more that 18' tall through the opening and I have to swivel my hips to get past the narrowest point. I'm 6' 3", other may not have this problem. But, the landing is nice and unobstructed, unlike when I used a ladder. My ceiling is 8 ft, so I removed one section , which was easy. I selected this unit because my opening isn't standard size and changing the opening so that a standard size stairs would fit was going to be a lot of work. But, the hand holds that the scissors on the stairs provide are nice. Rated 1 out of 5 by Unhappy from The ladder blocks 25% of the opening.... The ladder blocks 25% of the opening. Rated 5 out of 5 by Evan from Yeah, it was a good product. I detached the... Yeah, it was a good product. I detached the actual stairs from the wooden frame and just adhered them directly to a pre-existing metal joist a few inches underneath the actual opening. I had to remove the floor rollers on the bottom of the ladder since I didn't have any support braces attached to the support bolts that are 3/4 of the way up the ladder. The rollers would've caused problems and allowed the stairs to buckle (in my specific situation/scenario to add retractable stairs to existing skylight). Rated 5 out of 5 by Sherry from very sturdy -- met my needs exactly; looks great and... very sturdy -- met my needs exactly; looks great and easy to use! Rated 2 out of 5 by Kai from All 4 corners were damaged slightly. Also, one of... All 4 corners were damaged slightly. Also, one of the 4 bolts fastening the removable ladder segment was missing. There is no way to remove more than 1 segment except by cutting the rivets fastening the non-removable segments.